On August 5th The Heckscher Museum of Art in Huntington, NY opened Ebb & Flow: Seascape and Shoreline Views, an exhibition of works from the Permanent Collection that reveals varied aspects of the coastal environment and the enduring allure of the sea. 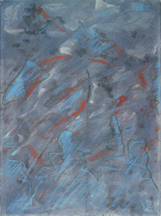 Included alongside works by Arthur Dove, Thomas Moran, Stan Brodsky, Betty Parsons, Jules Olitski, and Maurice Prendergast, among others, is Goldfish (49) II, 1983-84, a monotype and pastel on paper in the museum collection since 1992. The exhibition is on view through 12 November 2017.